Many thanks to Gabi and Dave for getting this party started! 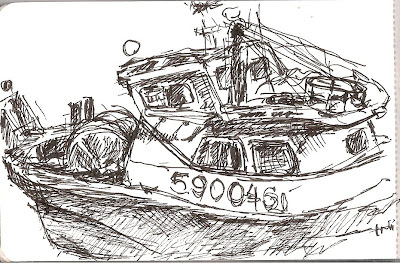 Here are a couple sketches from a day at Fishermen's Terminal a couple weeks ago. Don't know why this place isn't crawling with artists! 360 degrees of irresistible sketching! you're welcome Beth, this is fun! you're right about Fishermen's Terminal, it's a sketchers paradise, maybe we should go there for our first USk Seattle sketchcrawl! Name the day and I'm there!!! Love your drawing Beth. Makes me feel nostalgia for a very fine day at the Fisherman's Terminal. I second(or third) the idea of going back there to draw. It's a very hard job to draw ships on sea for their moving in and out, or up and down. Wonderful drawing! thank you folks for your kind remarks! Hope we all meet there again soon!